Canary Islands or not, La Palma isn’t always sunny. Water dripped from the low, rough ceiling of the tunnel like a shower in a bad hotel with low water pressure. To my left, water rushed along in a channel one foot wide and one foot deep. I came to another “window” where the tunnel broke through to the outside world. I was already soaked, so I stepped through the curtain of pouring water onto the tiny ledge beyond. It was like stepping into Tolkein’s Middle Earth. The ground dropped so steeply that it looked as though I was flying over the impossible green and steep valleys of a fantasy painting. Most startling of all, I had a circular rainbow round my knees. This was worth the lung-bursting walk up to Casa del Monte before joining the canal, although if I’d had a 4×4 I could have driven that far. It was worth stepping carefully in the places where the path had crumbled to a mere 9″ wide with a heart-stopping drop over the edge. If you fell, you might be able to stop yourself by grabbing a tree. Maybe. This is the Nacientes de Marcos y Corderos, the most beautiful of all walks on La Palma, the most beautiful island in the Canaries and probably the world. I came here on a three year contract and never left. Except that it’s not really an island, it’s a miniature continent, thirty miles long. Only a full continent could hold cloud forest and semi-desert, bananas and horizontal, foot-long icicles. On most days of the year, you can decide which climate you fancy and then drive to it. The main reason for this extreme variety is the island’s height and steepness. Roque de los Muchachos, the highest point on La Palma, is 7,900ft. At this altitude the air is 25% thinner than at sea-level and crisp packets occasionally explode due to the pressure difference. Almost a dozen international telescopes cluster around the peak, looking like immense metal puff-balls. 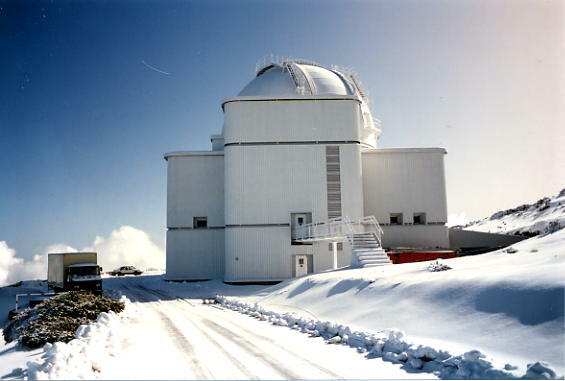 The Isaac Newton Telescope in winter, at 7,700ft. Up here, you mostly look down on the clouds. The air is free of pollution and turbulence, making this one of the three best astronomical sites in the whole world. On a good night, using modern computer controlled optics, these telescopes can perform as well as the Hubble Space Telescope, but they’re only open to the public for four days in the summer. Please note, when your telescope could see a candle on the moon, you do not want people driving past with car headlights on. You don’t even want handheld torches around. Would amateur astronomers please stay about a mile away. Thank you. As the crow flies, this is 7 miles from Los Tilos and 21 miles from Teneguia. In any case, from November to April it’s wise to check on the weather before visiting the Roque. Most of the time it’s clear, but ferocious winter storms howl in, dump knee-high snow or shrink-wrap everything in two inches of ice, and then disappear as suddenly as they arrived. When the Italians were building the Galileo telescope, one such storm crumpled their giant crane like so much cooked spaghetti. Most of the time, the Roque is beautiful. In June, the entire mountainside turns yellow as the codeso bushes, relatives of gorse, flower. The ground falls away very steeply. From the Roque itself to the nearest bit of coast line is only five and a half miles – that’s an average slope of one in three and a half. The prevailing easterly trade winds pile clouds against the north west of the mountain, and inside the clouds is an ancient forest of laurels and heather trees. 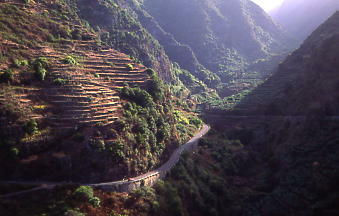 Since La Palma is an island, many of the plants here have evolved in isolation, making them unique. I saw an overweight, arthritic botanist bouncing like a child on Christmas morning, almost incoherent with delight. “Oh my! Woodwardia. I hoped I’d see that but I didn’t dare hope too – Canaria canariensis! Oh look at this and -” He said that when he dies, he doesn’t want to go to heaven; he wants to come to La Palma. He was even fascinated by the roadside weeds, which the locals found hilarious. At higher altitudes, it’s too cold for the laurel forest and the pines take over. Canary pines are not identical bottle brushes like a Forestry Commission plantation. They look more like Scot’s pines, each unique, like gigantic, stately bonsais. Their bark is deeply cracked in patterns like a giraffe’s neck, and in many places the cracks are jet black. Poke a finger in, and it comes out sooty. In 1994 the island suffered a series of four forest fires. Fortunately Canary pines can burn for six hours and still live. For months the forest looked like a sick parody of winter, with leafless black trees and pale ash covering the ground. When the winter rains finally came, emerald bracken shoots covered the “snow” and blue-green needles spring out of the blackened bark. Green is still my favourite colour. The cloud which piles up on the East of the island frequently reaches up to the long ridge down the centre of the island, the Cumbre Vieja, and spills over in a waterfall effect before evaporating in the warmer air below. This can be seen from the Roque, or from the road to El Paso just West of the ridge. It is beautiful by day and breathtaking by moonlight. Since the wind leaves its moisture on the North East of the island, the South West is near desert. The pine forest grows to a much lower altitude. Below it lie vineyards and fallow fields of black volcanic gravel. It’s hard to believe this is only twenty miles from the cloud forest. Lower down, acres upon acres of banana plantations swelter in giant greenhouses made of plastic sheeting which stops the wind browning the edges of the fruit. The sunniest beach on the island is here, at Puerto Naos, but the waves are better for surfing than paddling children. Further south at Teneguia, near Fuencaliente, the land becomes semi-dessert just 23 miles from Los Tilos. At the southern tip of the island is the salt factory. Sea water is pumped up to shallow lagoons and left to dry. When it’s ready for collection, it’s blindingly white under the sun. Beside the salt lagoons is a tiny bay with a bar that serves very good croquets. It’s a delightful place to sip local wine and watch the sunset, and if you’re very lucky you might see the last rim of the sun turn apple green just before it vanishes. This green flash only happens where there’s a low horizon and no pollution. On the other side of the salt factory is the volcano Teneguia which last erupted in 1971. The entire island is volcanic, and in places the lava flows from 1949 are spectacular. 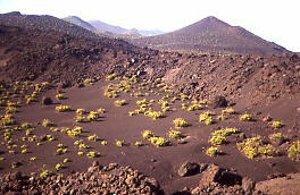 In fact the geological term “caldera” for the crater at the top of a volcano comes from the Caldera de Taburiente in the centre of La Palma. This makes it ironic that the Caldera is almost certainly not a caldera at all, but a gigantic erosion feature. In any event, it is spectacular. The best view is from la Cumbrecita, where you can look down a thousand feet to the valley floor, or across to the mountains on the other side, towering two thousand feet above you, a mere five miles away. Some people say the Caldera looks bigger than the grand Canyon, because your brain can just about accept the size of the Caldera, whereas faced with the Grand Canyon, it gives up. At all events, it looks too steep and too beautiful to be true, like a fantasy painting. Frodo and Gandalf really ought to be fighting off orcs in the foreground. Factual information about visiting the island here . My blog about La Palma island . Top Ten things to See and Do on La Palma . Country Houses for Rent on La Palma. 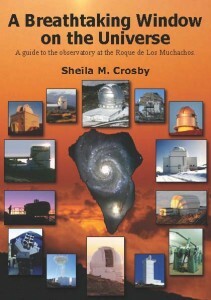 How to visit the Astronomical observatory at the Roque de los Muchachos. Weather Forecast and Current Weather . The different attitude towards alcohol here A Better Class of Drunks. The confusion caused to the English by Spanish names. Photos of Telescopes at the Roque de Los Muchachos observatory on La Palma. My wife and I are planning a week in La Palma mid October this year. We’re hiring a car for the week to have a good look around. But we also want to relax in some sunshine. We’ve heard the south / west of the island is likely to have more sunshine hours at this time of the year – is this so? Which towns would you reccomend we consider staying in? Finally, is the rum factory on the island still open / producing? Not weather for walking at the mo! In Breña Baja the rain has gone from torrential to heavy. It’ll be nice when the sun comes back. I am hoping to visit soon. As I collect banana labels could you give me an address of the main banana company?